If you score the game-deciding goal in your first MLS game, you’re probably PSP’s Player of the Week. And if you pitch a shutout as a center back and play like a veteran, you’re probably PSP’s Player of the Week. So rather than just pick one, we’re handing out this award to a pair of Philadelphia Union teenagers who made a big impact in their MLS debuts, Anthony Fontana and Auston Trusty. Then there was that sick move in the 15th minute, when Fontana dribbled through two defenders inside the penalty area to nearly create a goal. In two years, that play will be a goal. It wasn’t a perfect outing, mind you. Fontana was not a significant part of the Union’s possession game, which is the opposite of what you want from a No. 10. He completed 31 passes. In comparison, Haris Medunjanin completed 99 and Bedoya 73. But it was pretty impressive from a teen in his first start. Did Auston Trusty look like a player playing in his first MLS match? Throughout the game, the center back rarely got flustered. In possession, he looked as good as any left center back the Union have ever played. His passing was excellent, rarely rushed, and rarely off target, save for a few ill-advised long balls. In defense, there were a few flighty moments, but he showed he could clean them up, most notably with his great open field tackle of Juan Agudelo just short of goal. It’s a classic example of a rookie mistake covered by rookie talent. We may not see a ton of Fontana this year, as the Union just brought in a veteran No. 10 to man that job. But the left center back role is Trusty’s to lose, particularly after this outing. 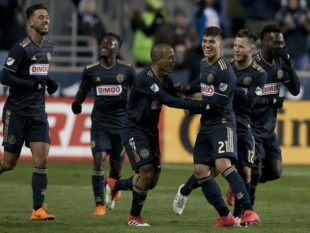 Was the job easier for the Union’s defense because New England played most of the match down a man? Undoubtedly. But Trusty passed the eye test just the same. He can play on this level. C.J. Sapong. He netted a goal and an assist, and drew the pivotal red card that changed the match. If not for him missing a few sitters early on, he could have had a hat trick (or more). It was an imperfect outing, but he made a huge impact. Refer today’s Daily News Roundup from Steve Whisler in the segment headed MLS, the last link listed, about the salary cap passing $4 million. The story, a run through of the 2018 MLS Rules and Regulations, reports that now a club keeps 100% of the proceeds from selling a homegrown player.